As many of you have already witnessed the disturbing video of a young Chinese girl involved in a hit and run and seemingly ignored by the whole world as she lay on the street with life-threatening injuries, it prompts the question: do we truly see ourselves as children of God? If you were to pose this question of the multiple passersby who ignored this innocent little girl, their actions or lack thereof already answer it. When we carefully reread this particular Catechism article (357) it provides us with a basic blueprint on respecting the dignity of the human person. 1. Because we carry the image of God we (human beings) possess and actual human dignity. 2. We are not just something, we are someone. 3. We have the gifts of an intellect and a will directly given by God Himself to act accordingly. 4. We are naturally created to enter into communion not only with our Father in Heaven but with our fellow man. Our very existence exudes a grace that leads us into communion with God. Grace leads to our response of faith to God and His people. The Word Made Flesh and the Dignity of the Human person. If we take the order of creation, God presents the plan of creation in full disclosure through His Son Jesus Christ. In Christ, man sees himself as he ought to be. Christ lays the foundations of man’s call to faithfully follow God’s Commandments (Ex 20:3-20) and exercise them (Beatitudes-Mt 5:1-12)in faith (Heb 11:1-2) and good works (James 2: 14-26). The “Word made flesh” signifies God’s response to man’s need to know the will of the Father and thus see the love He has for all of us manifested through His Son Jesus Christ. The Catechism stresses one of the reasons the “Word became flesh” was to be our model of holiness (CCC 459). This means an imitation of Christ in everything we do, including helping our fellow brother and sister in Christ. We see the people who ignored the injured little girl as lacking something that should be part of our humanity, whether we are Christians or not. Our human nature calls us to love one another whether we realize it or not (Jn 15:12). This theological virtue expresses that it is our highest calling to offer oneself to others in need. The very need of the child, regardless male or female, was calling out to her fellow humans! In principle our actions should mirror those found in the parable of the “Good Samaritan” (Lk 10:25-37). At closer look, this parable serves as a practical, spiritual guide for human behavior toward towards all in need. No matter what the circumstances, a man in need is a man in need. Our first response is rooted in love. The Samaritan displayed immediate compassion where the priest and the Levite made no attempt even though both were kinsmen (fellow Jews) of the man who fell. 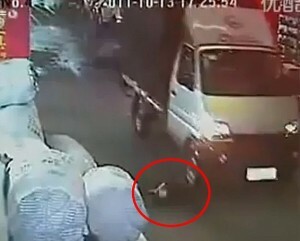 We can only imagine what thought or lack thereof went through the minds of those individuals who passed by this helpless injured little girl, let alone the van driver who sped away. What is most disturbing is the lack of concern i.e. a lack of love towards this child of God. Blessedly, we can find other examples of people caring, even risking harm to themselves to help others. We feel nobler just seeing their concern and selflessness. Here is a wonderful example. Beloved, let us love one another; for love is of God and he who loves is born of God and knows God. He who does not love does not know God; for God is love. In this the love of God was made manifest among us that God sent his only-begotten Son into the world, so that we might live through him. In this is love, not that we loved God but that he loved us and sent his Son to be the expiation for our sins. Beloved, if God so loved us we also ought to love one another. No man has ever seen God; if we love one another, God abides in us and his love is perfected in us (1 Jn 4:7-12).